Late last night, after a weekend of negotiations, the House released a $1.070 trillion omnibus spending bill, which will fund the government through September 30, 2017. Votes on the bill are expected this week in order to avoid a government shutdown when the continuing resolution expires at the end of the day on Friday, May 5. The big highlight for the afterschool community is that Congress increased 21st Century Community Learning Centers funding by $25 million over the FY2016 level, to $1.19 billion—a win for children, families and the country. The proposed increase means doors to quality local afterschool and summer learning programs will stay open for 1.6 million students and families. Additionally, it will make programs available for 25,000 of the 19.4 million students currently waiting for access. This increase was a significant turn of events given that previous FY17 funding proposals would have cut up to 115,000 students from 21st CCLC funded afterschool and summer programs. This increase is especially noteworthy following President Trump’s proposal to eliminate the program in his FY2018 budget preview, which drove friends of afterschool to reach out to Congress with more than 57,000 calls and emails, energized supporters to turn out at town halls in their communities, and prompted more than 1,400 local, state and national organizations to sign a letter in support of Community Learning Centers. Champions of the program on Capitol Hill showed strong support for Community Learning Centers as well, with 81 members of the House coming together across party lines and signing a letter in support of the program. A huge thank you to all who worked so hard in support of Community Learning Center funds. 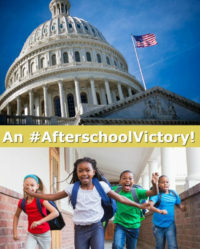 Keep up to date with the latest on federal afterschool funding on the Afterschool Alliance’s blog at http://www.afterschoolalliance.org/afterschoolsnack/ASnack.cfm?idSection=4. A blog post later today will include info about other funding streams such as CCDBG, Americorps, Full Service Community Schools and more. This bill will fund the federal government through September 2017. The funding for October and future years is still uncertain, and we will be holding a National Call-In day to support on-going federal funding of afterschool on June 7 – more information to come! Here’s the latest on state funding for afterschool programs.